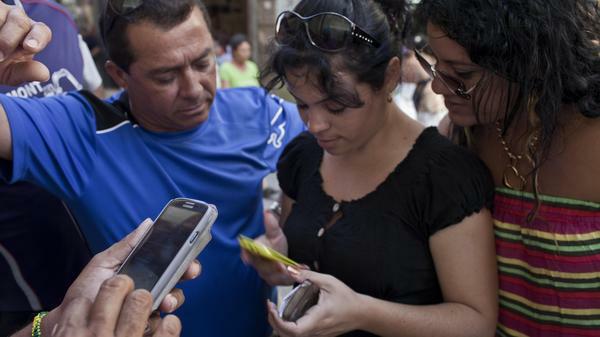 Cubans try to connect to the ETECSA server during a May 9 service outage as they wait with other customers outside the offices of the state telecom monopoly in Havana, Cuba. Cuba's government has blamed technological problems on a U.S. embargo. Critics of the government have said it deliberately strangles the Internet to mute dissent. Changing U.S.-Cuba relations may prove who's right. This week's historic agreement between the U.S. and Cuba to reinstate diplomatic relations after decades of silence could launch a digital revolution in the island nation. According to the White House, only 5 percent of Cubans have access to the open Internet, comparable to North Korea. As part of the deal, that could change overnight. Maribel Fonseca, a teacher in Miramar, Cuba, has never seen the Internet. A few of her more privileged students have been online. "I work in a school where members of the military and foreigners and top people in the country are," she says over a terrible (and very expensive) phone connection. "They use it. They go shopping, they see things I haven't seen." What she wants to see most is her family. Fonseca's sister lives in the United States, and it's been more than a decade since they've seen each other. Her voice lights up at the idea of video-chatting with her. "I can guarantee if I could have Internet at home, I'd talk to my sister every single day. I wouldn't miss a minute of her life. I love her so much," she says. Aidil Oscariz, a Cuban who lives in Miami, says students back home ask people abroad, like her, for the latest research papers, and even for news about Cuba. State-owned media don't report reliably on crime or corruption, but underground bloggers leak stuff out. "Sometimes I have actually found out things that are happening in Cuba before some of my family members [there] have," Oscariz says. Cuba's only telecommunications company, ETECSA, is government-controlled. This week's announcement could mark the end of that monopoly, and pave the way for free-market competition and growth. "I don't know that the Castros are ready for an information revolution," says Alec Ross, who was a senior adviser on tech issues for the U.S. State Department. "But they're a couple old men. They're going to die sooner than later. And I think that they're trying to salvage something." Ross, now a fellow at Columbia University's School of International and Public Affairs, says Cuba won't just light up with bandwidth immediately. The government has to start a bidding process. Mobile operators (presumably foreign-owned) will buy leases and build networks, putting in hundreds of millions of dollars in capital. That's step one. "Step two is determining and seeing whether, once Cubans actually go online, are they allowed free expression?" he says. "Or is the Internet more like it is in Iran?" It's a hot question — though interestingly, it's also somewhat peripheral. In plenty of countries, Ross says, government control has a chilling effect on online speech. But as seen during the Arab Spring, if a wireless signal is there, citizens will use it. U.S. tech companies like Google, Facebook and CISCO are watching how commercial policy shapes up. Kenth Engo-Monsen with the European telecom operator Telenor says these companies can play a huge role in keeping the Internet free: If and when a government asks for a secret surveillance deal, they can say no. "That's not part of being a mobile operator," he says, "because you have your relationship with your customers, and that is built on the trust that you have with them." Engo-Monsen says he's happy for Cuba, and that he views the Internet as a human right. Nathan Eagle, a mobile technology analyst with Jana, says companies are going to compete fiercely to get the Cuba telecom contract, and that will help Cubans. "Once third-party mobile carriers come in, they bring tariff plans — they price connectivity in a competitive way" so the average Cuban can afford service, he says. And this deal between the U.S. and Cuba to reinstate diplomatic relations could be the beginning of a new revolution on the island, a digital revolution. According to the White House, only 5 percent of Cubans have access to the open Internet. As part of this deal, that could change quickly. NPR's Aarti Shahani reports. AARTI SHAHANI, BYLINE: Maribel Fonseca is a professional, a teacher. And she says she has never visited the Internet. SHAHANI: She doesn't know it. She's in Miramar, Cuba, and we're speaking over a miserable and very expensive phone connection. A few of her students have been online. SHAHANI: She says, I work in a school where members of the military and foreigners and top people in the country are. They use it. They go shopping. They see things I haven't seen. What she wants to see most is her family. Fonseca's sister has been in the U.S. for more than a decade. Her voice lights up at the idea of video chatting together. SHAHANI: She says, of course. I can guarantee if I could have Internet at home, I'd talk to my sister every single day. I wouldn't miss a minute of her life. I love her so much. Miami Cuban Aidil Oscariz says students back home ask people abroad like her for the latest researcher papers and even for local news. State-owned media doesn't report reliably on crime or corruption. Underground bloggers leak stuff out. AIDIL OSCARIZ: Sometimes, I have actually found out things that are happening in Cuba before some of my family members have. SHAHANI: Cuba has just one government-controlled telecommunications company. This week's announcement could mark the end of that monopoly and pave the way for competition and growth, capitalism style. ALEC ROSS: I don't know that the Castros are ready for an information revolution, but they're a couple old men. SHAHANI: Alec Ross was a senior adviser on tech issues in the U.S. Department of State. ROSS: They're going to die sooner than later. And I think that they're trying to salvage something. SHAHANI: Ross says Cuba won't just light up with bandwidth. The government has to start a bidding process. Mobile operators, presumably foreign-owned, will buy leases and build networks, putting in hundreds of millions of dollars in capital. That's step one. ROSS: Step two is determining and seeing whether, once Cubans actually go online, are they allowed free expression? Or is the Internet more like it is in Iran? SHAHANI: It's a hot question. Though, interestingly, it's also somewhat peripheral. In plenty of countries, Ross says, government control has a chilling effect on online speech. But if a wireless signal is there, citizens will use it. ROSS: They just often aren't talking about politics in ways that would anger their central governments. SHAHANI: U.S. tech companies like Google, Facebook and Cisco are watching how commercial policy shapes up. Telecom giants Verizon and AT&T have not stated publicly if they're going to bid for the Cuba contract. Kenth Engo-Monsen, with the European telecom operator Telenor, says these companies can play a huge role in keeping the Internet free. If and when a government asks for a secret surveillance deal, they can say no. KENTH ENGO-MONSEN: You have your relationship with your customers, and that is built on the trust that you have with them. SHAHANI: Engo-Monsen says he's happy for Cuba, and the Internet is a human right. Aarti Shahani, NPR News. Transcript provided by NPR, Copyright NPR.